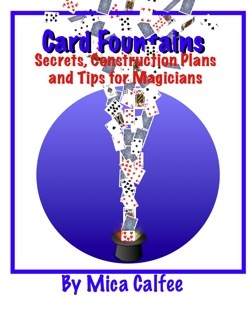 I will be lecturing on card fountains and giving one away at the 2015 TAOM convention in Austin. "Wow! When the cards flew out of the bag the children went crazy. It was like the 4th of July." - Judy C.
"The show as great, but I can't believe I had just put my camera down when the cards came flying out of the sack. That was amazing!" Click on photo below for video. See also his online book and plans store. PLEASE READ THESE CARD FOUNTAIN TIPS! 1. Newer, flat cards often work better than old bent cards. 2. Do not pack (or jam) cards tightly into holder. They need to be a little loose. 4. Use the best batteries you can find. Cheap batteries might have the correct volts, but strong amps are needed to run motors well. I ALWAYS recommend Duracell. IT MAKES A DIFFERENCE! We also have 18 v. push button / non-radio controlled card fountains. Possibly the most powerful battery run card fountain you can buy. Click on the photo above, or the link below, for more info. As Seen on "America's Got Talent!" This card fountain comes with several features. Two key fob transmitter buttons. Will hold two decks of cards. Much Smaller in size than our previous models with two angled corners to fit in smaller places. Dimensions are: H 4 3/8 in. W 4 in. L 5 1/16 in. Our new 2015, v2.2 card fountain is also easier to work. The key fob has two buttons. One is an "On" button and the other is an "Off" button. This allows you to control the action exactly how you want it to be. No more needing to decide if you want "latch" or "intermittent" mode. The price is now just $250 with free shipping included to anywhere in the Continental U.S.
to have a PayPal Account. All Shipping and/or tax is included in the $250 price. (NOTE: Your receipt will probably say $230 + $20 shipping. "I love my new card fountain! Reliability was one of my main concerns. I don’t want to take a chance with props not working during my shows. This fountain performs flawlessly and shoots the cards silently into the air - every single time. It has several features which I consider essential. It has an on/off switch on the main unit with an LED light. At a glance I can tell that the unit is ready. The remote also has a light so I can test it before the show to make sure the battery is good. I couldn’t be happier with this unit. Thank you!" "This morning I used my new card fountain for the first time. Wow! The routine was great and had loads of laughs, but when the cards shot out, 500 kids all gasped in unison and spontaneously clapped. Awesome! Thanks Mica Calfee." - James Munton. 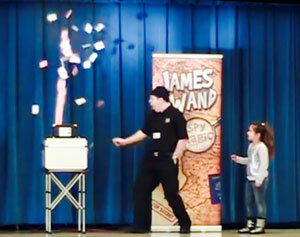 I used the card fountain for a couple of shows on Saturday. It was a big hit, and I am sure it will become a regular feature in my standup shows. The only problem is, I will wish I would have known about you and your marvelous card fountain years ago. Thanks for the great service and all of the additional tips." "The card fountain is absolutely great. 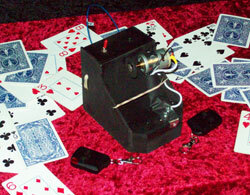 I used the card fountain most effectively with a card prediction/card stab effect at a private Christmas party. It was a hoot and the kids went wild!" - Geoff Grimes, Texas Magician. "Just received my card fountain in the mail today. Tried it and it's great!!! Thanks again. Jim. W. (Utah)"
"I got one last year and it is great. I use it and love it." Ash Adams, Fort Worth, TX. "It went over very well...when the cards flew up out of this large floppy-style hat I have, you could hear an audible gasp of wonderment. There was a mixed audience for my performance and you could see the adults react as well as the kids. I found two very impressive and identical knives, the ornate handle and scabbard sort of dirk, with a blade about ten inches long, and I did a quick switch and brought the blade up right in the middle of the card blossom. It looked like real magic even to me. And you should have seen the kids scramble to pick up the cards for me, you may have had that same reaction in your use of the card fountain. Thanks again. I know this will be a permanent part of my act for a long time to come." 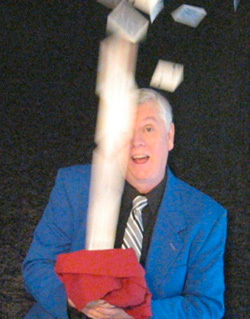 - Hal Hudgins, Dallas /Fort Worth Magician. I really don't know what to say about it. Delay and rechargable. $129.99 + shipping. Notice the low height it reaches. Make sure that this is what you want. This fountain appears to be quite large, but very ingeniously made. The clockwork timer is amazing. Unfortunately I don't have much more information other than the YouTube video. A very nice (El Duco) fountain for $590. But soon no longer available due to the sad death of El Duco. $250 Same maker as what Hank Lee's used to be.